Explore the mysterious temples and breathtaking landscapes of Cambodia and Laos on this 8 day journey through Indochina. From floating villages to towering ancient temples and mysterious Buddha-filled caves, this tour takes you deep into the wonders of these two beautiful countries. Price from: $934 - Book now! Welcome to Laos’s capital. Vientiane retains an old-world charm that is becoming increasingly rare. With its wide, open boulevards and many golden temples, this sleepy city hardly feels like a modern capital. Upon arrival at the airport, you will be picked up at the hotel by our representative and transferred to hotel for checking in. Time for relaxation afterward. Vientiane- the charming and fascinating capital of Laos, one of the classic Indo Chinese cities which conjure up exotic images, with its intriguing mix of Lao, Thai, Chinese, Vietnamese, French, American and Soviet influences. Today, after having the breakfast at hotel, join us on a full day tour exploring the city main attractions such as the National Museum, Wat Sisaket - the city‘s oldest surviving temple with thousands of silver and porcelain images in the gloriously authentic temple compound that offers you a glimpse into the Vientiane of the past, the Haw Phra Kaeo. In the afternoon, wander in the older part of the Morning market before visiting Pha That Luang, the giant golden stupa. Next, you will go to climb the Arc De Triomphe of Laos, Patuxai. The massive arch has a beautiful mosaic tiled ceiling and once at the top you can see for miles around Vientiane. Later of this day, transfer to airport for your flight to Luang Prabang. Upon arrival, you will be met and driven to the hotel and relax then. Day 3: Luang Prabang - Pakou Caves. Later, on the way back to Luong Prabang you will visit Ban Xieng Khong and Ban Xieng Lek which are very famous for making Saa Jute paper. Back to town where you will then challenge the steps up Mount Phousi for an enjoyable exploration of the sacred, gilded stupa as well as a beautiful sunset view. Transfer back to the hotel and enjoy your easy time afterward. Day 4: Luang Prabang Kuangsi Waterfall. After partaking in an alms ritual, the first visit in the morning will be Wat Xieng Thong, the Golden City Monastery, which dates back to the 16th century and is considered to be the finest in Laos. Then, transfer to Ban Ouay, Hmong Hill tribe village followed by Ban Thapene of Khmu village. Continue driving to Ock Pop Tok, the local Crafts Centre where the fascinating world of Lao textiles comes alive! Set in the grounds of a stunning tropical garden on the Mekong, it's the perfect place to learn more about this unique Lao art. Transfer back to the hotel where you will spend the rest of the day at leisure. Have breakfast at the hotel and then enjoy a short tour to visit Wat Wisoun, Wat Aham and Traditional Art and Ethnology center. Later of this day, driving to the Luang Prabang Airport to catch your flight to Siem Reap. Up on arrival, you will have a guided transfer to hotel for checking in. Today you will visit some of the oldest temples in the Angkor complex. After breakfast, transfer out of town to the ancient capital of King Indravarman I (877-889), referred to as the Rolous Group and known as the birthplace of classical Khmer art and architecture. Next, drive to Banteay Srei, one of the most beautiful temples; built in 967 AD by Jayavarman V's guru, it showcases the most exquisite, deep and complex carvings in all Khmer architecture. Next explore Banteay Samre. On the way back to town, you will watch the sunset in Pre Rup, considered as Mini Angkor Wat. Today you will discover the mysterious Angkor temples. Wake before dawn and take a “tuk-tuk” ride to visit the magnificent Angkor Wat - the largest Khmer temple and finest example of Angkorian art and architecture. Back to the hotel then to enjoy your breakfast and have a short break. Set out on the trip to Angkor Thom from its west gate. From the enigmatic faces of Bayon Temple to the intricate base reliefs of the Terrace of the Elephants, Angkor Thom is filled with fabulous monuments. Next, stop is the South Gate of Angkor Thom- the beautiful and old Gate with its majestic doors and artifacts. Then, transfer to discover the jungle-covered temple of Ta Phrom before going back to the hotel. In the afternoon, transfer to Tonle Sap, the largest freshwater lake in South East Asia where you will board a traditional wooden boat for the lake discovery. Stop at some floating villages to visit, you will learn more about the local life. Stay until the sunset to enjoy it then, return to Siem Reap in late afternoon. You will have free time before taking the transfer to Siem Reap International airport for your departure home. 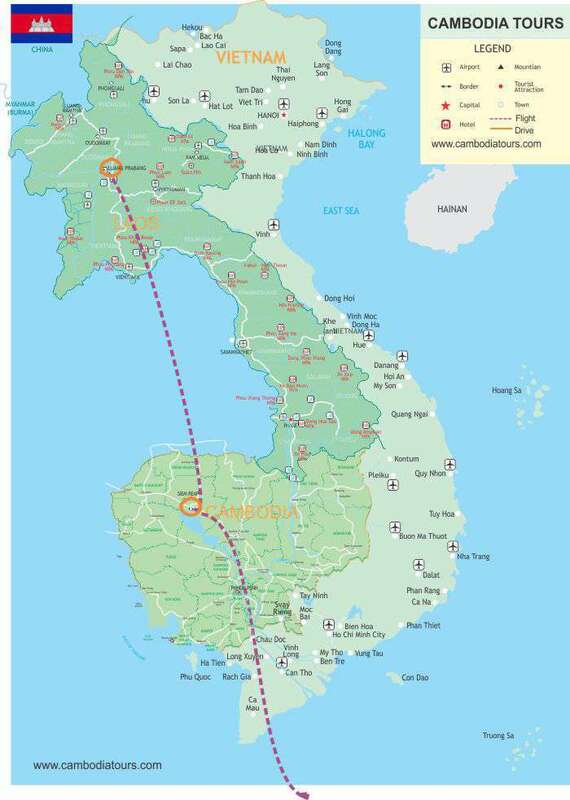 Note: Visa to Laos and Cambodia is easily get on arrival airport. 2 photos (4cm x 6cm) is needed. Visa Stamp fee (more at www.cambodiatours.com/visa). Will the last week of October be too rainy for this tour? Thank you! The raining season in our region ends at the end of September. The last week of October is very good time to take the tour Highlights of Cambodia and Laos. As the weather is nice and sunny. Our Travel consultant just sent a copy and detail of this answer to your email.